Sometimes you like your interior as bright and brilliant as the midday sun, but when you’re looking for an afternoon nap or a little added privacy, high-quality window treatments can be your best friend. Take control of your windows and dress up your favorite rooms with a beautiful selection of window coverings, curtains and drapes at JCPenney. 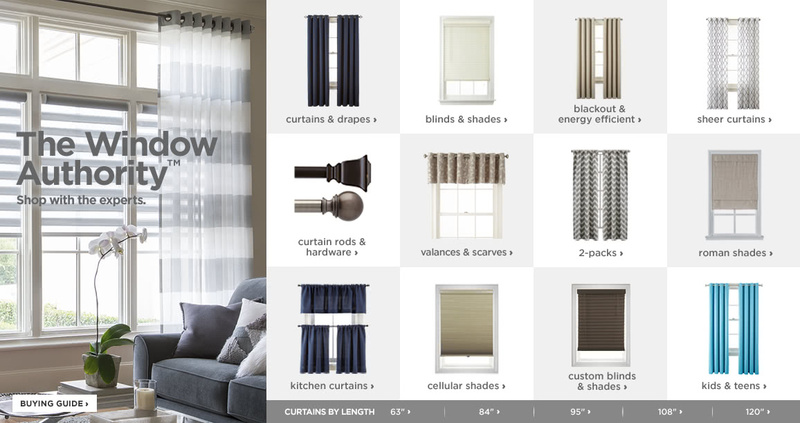 Not all blinds are equal: select a style that serves the purpose you’re looking for. Countless options are at your fingertips, from the elegant construction of sheer curtains to the modern appeal of Roman and cellular shades. Go natural with dark wood blinds or accessorize your preparation station with kitchen curtains that feature convenient sliding coverings on the bottom half. These days, more and more people are finding creative ways to cut down on their utility bills. Take a chunk out of your monthly heating invoice with thermal curtains. These curtains ensure winter cold stays out and heat stays in. Save even more money with useful blackout curtains that will help to regulate temperature, sunlight exposure, and sound levels. It's a window treatment that saves you money. But there’s more to decorating than covering up. Valances can serve as gorgeous accents on windows you would rather not leave the hardware exposed. Choose from options like flowing waterfall valances, lace jacquard panels and voile window scarves and dress up your window. You can even complete your project with unique curtain rods with a wide variety of intricate features and materials. Don't forget that you've got access to a wide variety of other interior decor, accents & furniture that can all help to tie your living space together. Take a look at our home collection to get started!